There's no denying that the endless barrage of emails, pings and push notifications have us challenged as we respond to shifting priorities and an expectation of immediate responses from both our prospects and residents. Hear successful strategies for resetting your focus, establishing routines, and recharging your mindset that lead to a more balanced and productive work life. 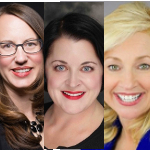 Join Jennifer Staciokas, Virginia Love, Debbie Phillips, and the Webinar Wednesday Team on October 9, 2019 at 12pm to Learn How To Manage An Overloaded Office! Ms. Staciokas is responsible for the national strategy and oversight of the Corporate Marketing, Property Marketing and Training departments for the Pinnacle portfolio. Jennifer began her career in the multifamily industry over 20 years ago. Since that time, Ms. Staciokas has served in numerous capacities at two of the nation’s largest property management firms focusing on new construction marketing, digital marketing strategies, employee development and corporate communications. Ms. Staciokas holds a B.A. in French from West Chester University and an M.A. in International Commerce & Policy from George Mason University. Jennifer is a regular guest speaker, facilitator, and moderator at many of the industry’s most renowned conferences as well as an active participant in NAA and NMHC. Virginia Love joined Waterton in 2007 and serves as vice president of leasing and marketing for the multifamily portfolio. In this role, Ms. Love manages the marketing team and is responsible for setting a strategic vision for all leasing and marketing efforts. She began her multifamily industry career with Trammell Crow in 1991 and previously served as training and marketing manager for ING clarion, education director for Watermarke Companies, and regional trainer for Summit Properties. She has presented countless leasing, marketing, and operational training sessions at the local, state, and national association level. Based out of Atlanta, GA, she serves on the Atlanta Apartment Association board of directors. She is also a member of the Georgia Apartment Association board of directors, serving as chairperson in 2018, a NAA Lyceum graduate, chair of the NMHC Marketing and Brand Management Committee and member of the OpTech Planning Committee. Ms. Love is a graduate of University of Southern Mississippi. Debbie Phillips is an entrepreneur and real estate professional with over 30 years of industry experience. Debbie has a multi-faceted career managing diverse real estate assets including developing world-class leadership development programs and talent management strategies. Debbie believes in the philosophy, "you can dream, build and create the most beautiful place in the world, but it takes PEOPLE to make the dream a reality." Debbie’s mission is developing top tier talent that adds value to an organization through increased employee engagement.